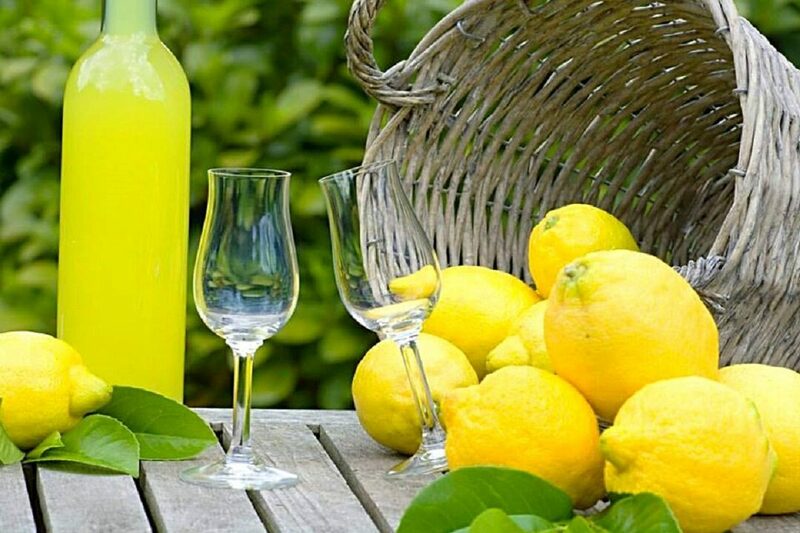 The authentic Limoncello is made exclusively with lemon produced in Sorrento or Amalfi. The traditional infusion needs 3 weeks, but scientifically 3 days are enough. Initially, the Limoncello was served at room temperature, but in the recent years is tasted cold and neat. Choose only organic lemons not chemical treated. First of all. Peel the yellow part of the skin of the lemons and cut away any white part. Now, pour the lemon peel into a jar along with the alcohol. Close the jar and store in a dark place 3 days. Stir the peel once a day. The third day, pour the water in a pot along with the sugar and place over the minimum flame. Heat the water stirring until the sugar will be totally melted. Do not exceed the temperature; the sugar solution has not to caramelize. Eventually, sift the lemon infuse and combine the alcohol with the sugar solution at room temperature. The Limoncello must become bright yellow, not transparent. Serve Limoncello neat, cold or at room temperature. The traditional Limoncello requires an ABV between 30% and 35%. Here a tab to modify the amount of water to obtain the preferred Alcohol By Volume. Please, consider these data a general idea: making homemade alcoholic infuses with home utensils made impossible to obtain an alcoholic content accurate to the decimals. Last but not least: DRINK RESPONSIBLY! If the history of Limoncello does not go back very far, the legend of this sweet spirit is very ancient. It is said that the recipe of Limoncello was a creation of the Sirens. The father of the gods, Zeus stole and revealed it to a sailor. Starting from this legend, the Italian fishermen use to drink a glass of Limoncello in the winter mornings before going to work. Another legend says that were the Carthusian monks which shoo the sirens finding the recipe of Limoncello.